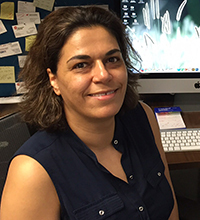 Mojgan Naghavi, PhD, was senior author on a study that found the human immunodeficiency virus uses proteins called diaphanous-related formins to hijack the cytoskeleton of healthy cells. A Northwestern Medicine study found the human immunodeficiency virus (HIV) uses proteins called diaphanous-related formins (DRFs) to hijack the cytoskeleton of healthy cells, findings that deepen the understanding of HIV infection and present a potential therapeutic target. The paper was published in the Proceedings of the National Academy of Sciences of the United States of America and the lead author was Michael Delaney, PhD, a postdoctoral fellow in the lab of senior author Mojgan Naghavi, PhD, associate professor of Microbiology-Immunology. The cytoskeleton, a network of interlinking filaments and tubules that gives structure to a cell and helps facilitate intracellular transport, has two important components — actin and microtubules. DRFs are involved in the regulation of both and HIV exploits discrete functions of DRFs to commandeer the functions of the cytoskeleton in a coordinated attack, according to the study. “The virus has evolved to mimic these two regulatory functions of DRFs,” said Naghavi, also a member of the Robert H. Lurie Comprehensive Cancer Center of Northwestern University. Many viruses depend on microtubules to navigate through a cell, being too large to passively diffuse freely within the cytoplasmic environment. Instead, they require active transport to the nucleus where viral replication can begin. Diaphanous-related formins promote trafficking of HIV particles (green) to the nucleus (blue). HIV also binds to DRF to regulate the disassembly of its capsid, a large protein shell that surrounds the HIV genome (a process also known as uncoating). 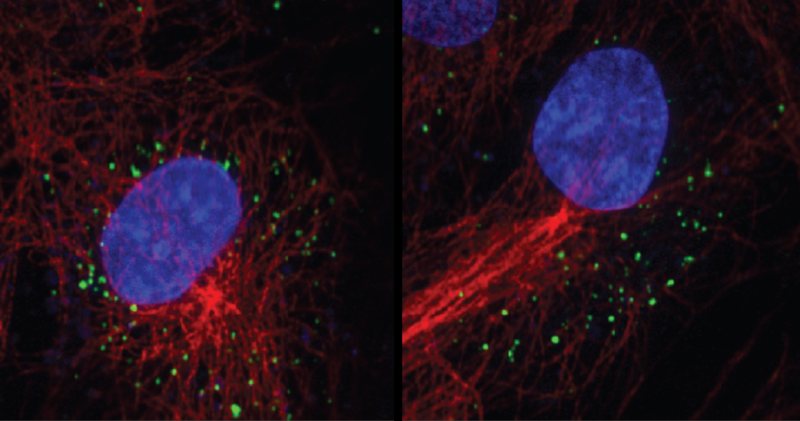 While in uninfected cells DRFs have dual functions that coordinate actin and microtubule dynamics, HIV exploits these multifunctional DRFs to coordinate its uncoating with trafficking on stable microtubules to reach the nucleus, according to the study. While previous studies had shown the virus somehow influenced microtubules, definitively identifying that pathway presents an opportunity for further study. Mapping the pathway would provide targets for intervention during early infection, according to Naghavi, but any treatment would have to tread lightly. This study was supported by National Institutes of Health (NIH) grants P01GM105536, R01GM101975, R01NS099064 and T32AI007476-19.